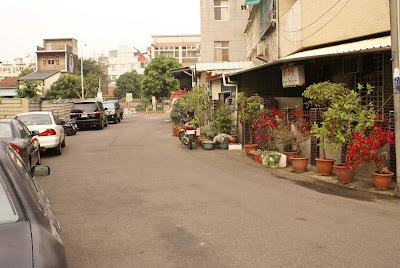 In Tainan, I met Peichi’s grandmother for the second time. 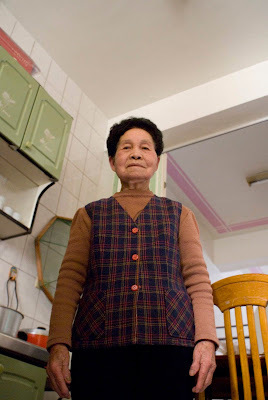 “Amma” is “grandma” in Taiwanese, which is exclusively spoken in most of southern Taiwan. It is far different than Mandarin Chinese, sounding a lot like Thai would if it weren’t nasal. Short staccato sounds punctuate each word. 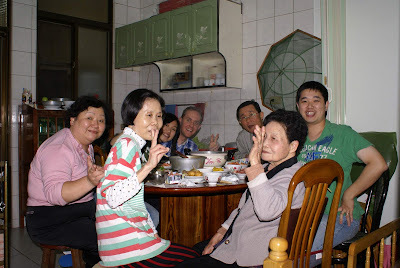 Peichi and her immediate family of origin speak both languages fluently. I don’t. I barely speak some Mandarin, but know only a couple of Taiwanese words. I have very few occasions to speak it at all. Amma speaks no English and very little Mandarin. This means that we cannot communicate at all without someone interpreting. I often say, “Two people can always communicate if they want to badly enough.” Amma is a slightly different story. In some ways it doesn’t seem that she recognizes that I am not developmentally disabled, but just speak a different language. I’m not saying she isn’t bright. She is Peichi’s stock. She must be. She is just from a world that is much smaller than mine in some ways, and the idea of what happens so far away must be unimaginable to her. The occasion of our first meeting was at Peichi’s and my engagement party in Taipei. She came in and sat down at our head table as part of the bride’s family. She is an adorable old lady. She is only slightly above four feet tall, if even that much, and she looks exactly like you would picture an Asian “amma” should look like. Just looking at her makes me want to simultaneously bear-hug her and show her great, gentle reverence. She plopped down right next to me, with her purse set behind her on the chair, the way some Asian ladies do, both to prevent someone from stealing it and so as to not forget it is there. It seemed to me at the time, that was probably not quite the most appropriate for the situation, and thought I would endear myself to her by being helpful. Big mistake. I patted her on the shoulder, smiled, and reached for her purse to hang it from the trestle on the chair back. Her eyes grew wide and she reached for it as well, holding it in a death grip. We played a brief game of tug-of-war as I tried to calm her. I lost. The purse was returned to its location. It was a busy evening, and I was never able to revisit the situation with her. But somehow I am sure that she was convinced I was trying to steal her, Peichi’s Amma’s purse at my own engagement party. She must have been thinking that all of the rumors about these Americans must be true. We are all uncouth charlatans and thieves. We arrived in Taiwan after a whirlwind tour through Tokyo, and my knee was sending distress signals with every step. The story of how this happened is a matter for another day, but suffice it to say that every step hurt, a lot, and stairs were impossible. After a four hour sleep, it was off to the city of Tainan. It is normally about a four hour trip, but at Chinese New Year it takes twice as long due to traffic. I ended up in a world very different than the one I usually inhabit. 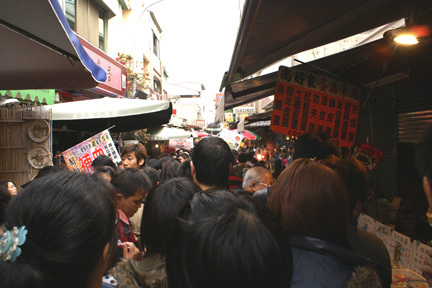 Taipei is a world-class city, in many ways identical to every other big world city. There is Costco, TGI Friday’s, Saks 5th Avenue, and million other exports of Americanism that has homogenized the world. That is good. It is also grievous. Anyone who has traveled much can attest to both. I’m not complaining. Taipei is awesome. It is a pleasure to visit. All of Taiwan, and Taipei in particular, has an energy that is frantic. It never stops. Tokyo is always busy, but there it is business. In Taiwan it is life in general. The mopeds speed endlessly along, constantly jockeying for position. When the work day stops, the night markets open. If New York is “the city that never sleeps,” then Taipei is the city that never stops to catch its breath. Night markets are ubiquitous here. They are constant crowds and energy. Exotic birds flutter in their cages, while men hoarsely squawk into loudspeakers hawking their wares. Men stir and fry in endless arrays of food booths, as throngs of people shuffle by. They are shoulder-to-shoulder, talking about which booth has the best Stinky Tofu, or which jeans are fake Levis. The night market is more than a crowd. It is a living, breathing organism. 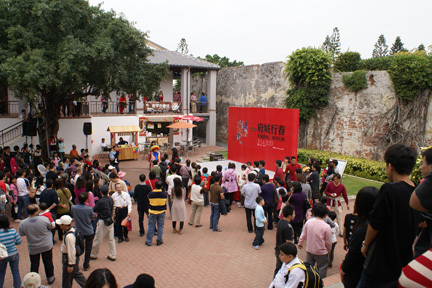 Taiwan is energy in ever form and every way, and its people feed that energy with a constant supply of food. When they aren’t out at a nice restaurant, they are snacking from street vendors, or chewing on fruit and seeds at home. When they aren’t eating, they are looking at food or talking about it. This place is a food-lover’s dream. There are millions of choices, and each city has its famous specialties. Most Americans could not appreciate the food here. It is more opposite of the American palate than any food I’ve ever tasted. Some dishes require a lot of commitment and character, but in the end it is usually rewarding. Sometimes it is a real challenge though, and Taiwan does not have a robust Health Department or FDA enforcing any codes or standards of cleanliness. Bathrooms are always dirty, furnishings are a distant afterthought, and I can’t figure out how street vendors could clean their hands and cookware. I’m sure they don’t. Many Americans would use all of this as reason to stay away from the food—their loss. For as much as they eat, the people are quite thin. Many are more rugged and old-world as compared to the West. Dentistry is probably a few decades behind the US in much of the country, but maybe it is more noticeable because they smile a lot more than people do in many other Asian countries. Sometimes the people who smile most have the worst teeth to show, but that is often because the people in the rural areas seem to be a lot happier even though they have a lot less access to the modern things we think should make us happier. As a “foreigner,” I stand out everywhere I go. I can’t help it. My eyes, hair, and skin are all a different color than theirs, and I stand a lot taller than many people. It isn’t like one might imagine. I don’t feel like Gulliver among Lilliputians, but I am taller. I stand out, literally. Some people choose to ignore me and hope that I go away. Many times this is due more to them feeling uncomfortable by me. 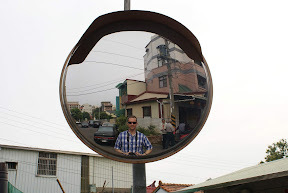 There is a sense of inferiority in Taiwan in general, and especially toward white Americans. This is true in many parts of the world. Other people look right at me and smile. Some of them walk right up and start saying all of the English words they know. This means that several times each day I am greeted by some stranger shouting “America! Hot dog!” at me as if my white skin also makes me slightly deaf. As they grin from ear-to-ear, I smile back and say “Hi!” It is humorous, but also really heart-warming. I’ve never shied away from being a spectacle anyway. 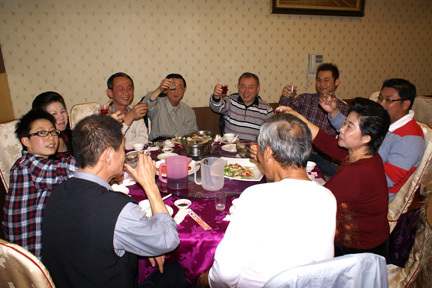 Most Taiwanese are very warm, and if they invite me into their home or business, they take care of me with great warmth and fastidiousness as if I were a greatly honored guest. For all their focus on food or commerce as Taiwan’s greatest asset, I think they really miss the brightest part of their whole culture. Their people are their greatest resource. They are not outwardly warm in the way many Southerners are in America, but once you are their friend they will not only give you the shirt off of their backs, but will convince you that it is for your own good that you take it. They will give endlessly with the same passion that they devour a bowl of noodles. This is Taiwan. Peichi and I recently got a free trip to San Antonio for the weekend. Here is some of what happened. Yesterday was my birthday. Typically, people enjoy their birthdays, I think. In recent years I have been increasingly becoming quite the birthday party-pooper. I can’t exactly put my finger on what it is that makes me feel so un-festive on October 1st. There could be a bunch of reasons, and perhaps many of them work together to make me a little bit gloomy and highly introspective. I feel a combination of wanting to huddle up in a ball behind the washer and dryer like some sickly cat, and wanting people to gather around me and make me feel loved. I endure it with a relatively normal look on my face. I do enjoy the love that people show me, for sure though. One of the things I’ve dealt with over the last couple years is the knowledge that I’m not getting any younger. When I was younger I dreamed that I would accomplish all manner of amazing things. These weren’t just selfish ambitions, but godly Kingdom goals too. But now the older I get, I see people around me who are my role models, and I realize that by my age, they had already accomplished much more than I. Some of them are now even younger than I am. It is starting to feel like that moment in a football game where you realize that there just isn’t enough time to score the three touchdowns you need in order to win, even if you keep the other side from doing anything. You start to have those thoughts of forced turnovers and onside kicks, but you also really wonder if it is all possible. Yeah, I know that I’m being overly dramatic, but I already told you that I’m in that sort of mood. It is my birthday. Indulge me a little. When I got home from Barnes and Noble, Peichi was waiting for me with some dinner and a mixed drink that she had made, and cupcakes she had just baked to top it all off. She is very good to me sometimes. I felt loved. As I was eating, she pulled out a milk carton. I’m lactose intolerant, which means that I can only drink lactose-free milk that just happens to cost twice as much as regular milk. She showed me the expiration date, a day in late August, a whole month ago. I’m bad with those kinds of things. I’ll be in the grocery store and see something on sale, and thinking that my frugal spouse will be proud of me, I’ll buy two. The problem starts when I forget to actually eat or drink said product. I’ll put it in the fridge. It will slowly move to the back as I reach for other things and just put them in front. Two months later, she’ll pull out an expired milk carton, half full of milk, half full of a green ecosystem complete with Greenpeace activists demanding it be declared a protected environment. I smiled nonchalantly and continued to eat. The date stared back at me, boring a hole in my forehead. As I ate, I realize that sometimes I feel a bit like that milk carton. I look back on my year and realize that some of who I am has just sat on the shelf. Some of my gifts have just not been used. Just like that milk, I have an expiration date. We all do. It isn’t known, but it is definitely stamped on our foreheads in some ink we can’t see, but it is indelible. We are also filled up with gifts, dreams, passions, and all manner of good stuff. 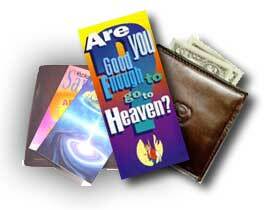 When we can’t use these in the way God intended, they just sit there and slosh around inside of us. I think that is why Proverbs 13:12 says “hope deferred makes the heart grow sick, but longing fulfilled is a tree of life.” I was meant for those hopes, gifts, and passions to be used for God and His kingdom. These are videos and pictures are from our trip last weekend to Colorado. I know that most people won’t have the patience to watch any of these, but we just wanted to share all the fun we had with our friends and family. I’ve had a really interesting mix of circumstances over the last week, which have really led me to think about the way Christianity interacts with the pluralism of this Post-Christian world. First, I met with a group of close friends over lunch to discuss faith, politics, and life in general. The three of us are very similar in many ways. We laugh at the same ridiculous jokes. We are all smart and well read. We all believe in living life with a strict sense of morality. However, we come from a diverse theological spectrum. One of us is a devout Catholic, one a Protestant pastor (me), and one an agnostic in a “crisis of faith” (his words). The interesting thing is that we can sit and deeply debate very difficult issues of faith, theology, and human existence. We discussed and debated for nearly 3 hours. It was so refreshing to me to talk deeply about these issues without someone feeling threatened that others not agreeing would somehow cause him injury. As I was meeting with my friends, my wife called to inform me that our friend from Taiwan had committed his life to Jesus. Peichi led an English class at church in the spring for university foreign exchange students. This program was largely based on building relationships between these students and American families within our church. We never gave a “come to Jesus” message. We never even led a Bible study, just food and conversation. But several students have become Christians lately, quite a few consider our church their home (even though they don’t understand even half of the sermon), and we baptized one this Sunday. Peichi and I have also started to really get to know some of our neighbors. One family that we have become friends with in particular is our downstairs neighbors from Iran. We each go to the other’s apartments, and we celebrate important events together. They are of the Bahai faith, and that is a very important part of their lives. They are not only some of the nicest people we know, but both my wife and I consider them to be dear friends. In each of these situations lately, I have interacted in situations where I wasn’t reaching down to save the heathen masses. People didn’t approach me initially for answers to their deep and burning questions. In fact, the very situations required that I faced these people as equals, and tried to be Christ-like and loving in a natural way. This blog really stems from who I am. I am a youth pastor/church planter, Internet entrepeneur, and the husband of an awesome woman from Taiwan. I have a passion for writing, seeing the Church use communication technology (specifically the Internet) in the most effective way possible, and helping to grow Christianity in America into what Jesus intended it to be. I blog about these things here in separate pages according to these various themes.